We were ricocheting around twisty island roads before we could even get the SUV doors shut. “Okay, we go!’ Alrick, our guide, called out as he cranked the wheel around. He had just eight hours last week to show us the natural wonders of Mahé, the main island of the Seychelles. He’d brake fast, climb out, and leave the car in the road, even on a curve. “You must see this!” he’d say, pointing to an orange-beaked Seychelles bulbul sporting a fauxhawk (or as he called it in Creole, a “mal coiffure”). Even through mirrored sunglasses, Alrick could spot the tiniest birds. This eager naturalist also skid-stopped for trees. He’d crush the leaves up so we could smell them in our palms: cinnamon, curry, nutmeg. The Seychelles produced many spices during its years as a French colony, and birds had spread the seeds around. The day wheeled on like this. With nearly 80,000 of the country’s 90,000 total residents, Mahé is the busiest of the Seychelles’ islands. Yet it’s so laid-back, not once in eight hours did anyone honk at our SUV blocking the road. 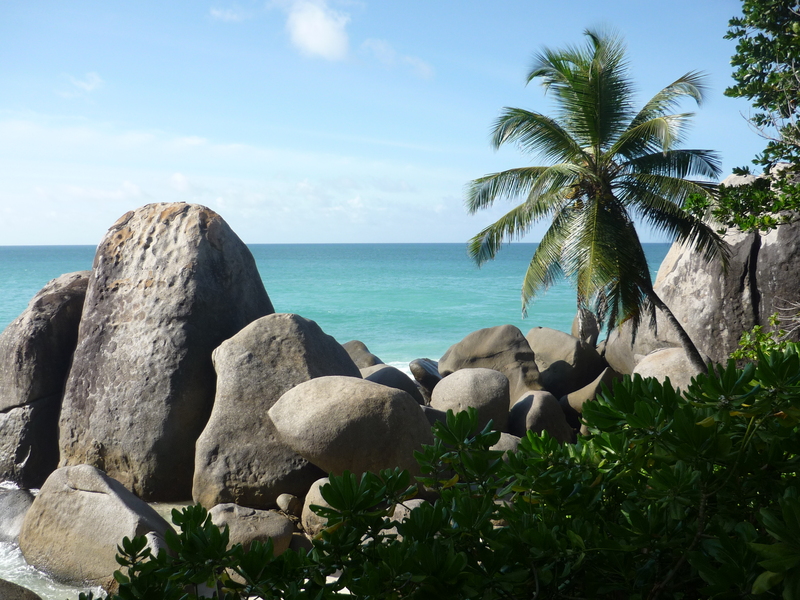 Granted, at almost a full 24 hours’ flight time from New York, the Seychelles isn’t easy to reach from the States. The 115-island chain lies in the Indian Ocean, a thousand miles off Madagascar (and 1,300 from the better-known Maldives). We never once encountered another U.S. tourist. One guesthouse owner, Fleurange, told us we were only the third Americans she’d ever had. On Praslin: Just as Northern California’s Redwood National Forest is a cathedral of sequoias and redwoods, Praslin’s Vallée de Mai is a cathedral of palms. Among five other endemic palm species, this reserve is home to the legendary coco de mer. Surely the globe’s most suggestively shaped plant, it’s been prized by pirates and royalty alike for centuries. Small wonder the Vallée de Mai is a UNESCO World Heritage Site that’s been compared to the Garden of Eden. 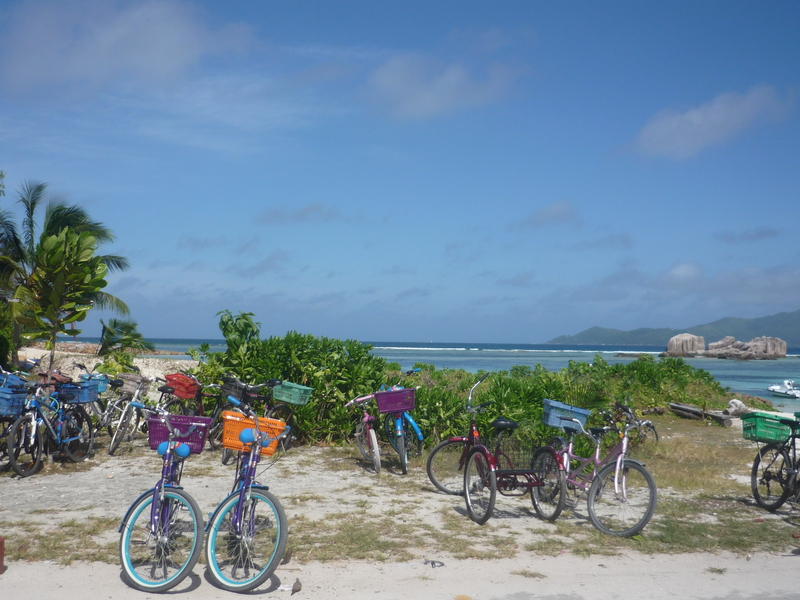 On La Digue: This island is so small, bicycles are the preferred mode of transport. We borrowed two mountain bikes from our guesthouse to cruise to the Seychelles’ famously wild, primordial beaches, framed by ancient granitic boulders balanced like huge mangos. Within a half-mile of our lodging was a national park, the Special Reserve La Veuve. There, the long-tailed Seychelles paradise flycatcher—one of the world’s 10 rarest bird species—swooped within feet of us. 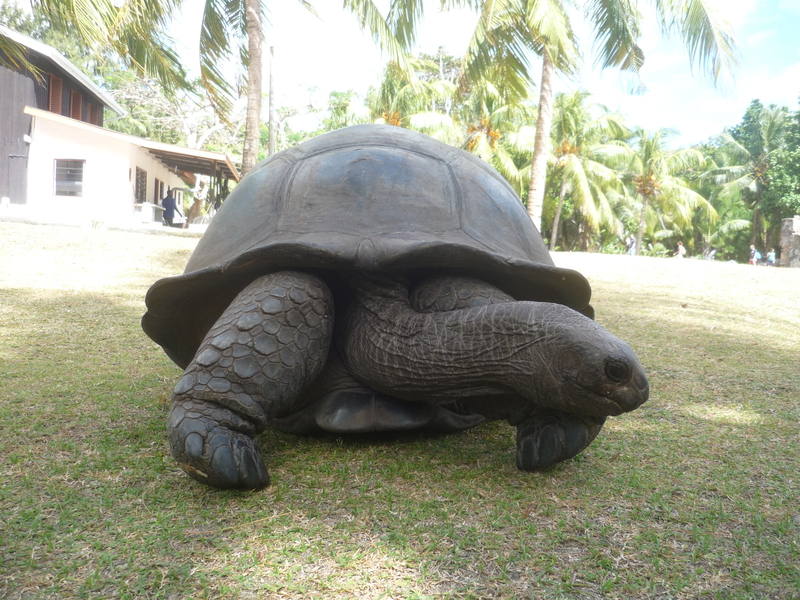 On Curieuse: We hung out with dozens of free-roaming Aldabra giant tortoises on a day trip to this island from Praslin. Locking eyes with these centenarians (who can live to 300) felt like staring at E.T., or at least relaxed dinosaurs. Their skin stretched like a leather accordion over their fat legs, and their eyes sunk deep in the heads. We followed these 800-pounders on lumbering walks, fed them leaves, and bent down for pictures as they stretched their heads far out of their colossal shells. We found Seychellois culture and food almost as exciting as the environment—but those are other stories. Look for more on our experience in magazines and newspapers over the next few months.